Ruling Fidesz is considered one of the most successful member parties in the International Democrat Union (IDU) because of its three successive election victories, Hungary’s state secretary of family and youth affairs said on Sunday after attending an IDU Executive meeting in Chile. The participants discussed recent developments in the European People’s Party within the European Parliament, Katalin Novák told MTI by phone. IDU considers Fidesz an ally, representing the same values as the international alliance, such as democracy, freedom of religion, protection of Christianity and traditional, conservative values in family policy, she added. 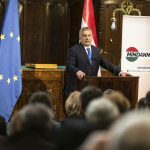 Novák briefed participants in the meeting about recent events in Hungary and the development of an opposition alliance where the extreme right teamed up with the left wing. “This development is a matter of concern for all because openly anti-Semitic political forces are now joining forces with the left wing to seize power,” she said.